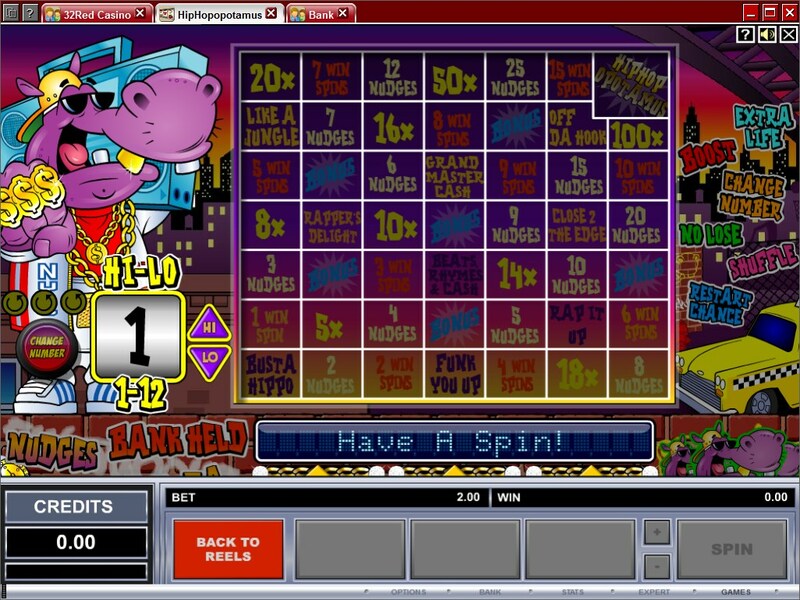 A Microgaming classic slot machine, HipHopopotamus has a lot more to offer than you might think at first, using a lot of features and a very busy design. It’s a cartoon style design, with a hippo being the main character, a bling wearing rap artist by the looks of it. The game’s title actually includes the Hip Hop part, but it mixes it with the hippo theme. It’s one of the Microgaming slots that looks like any other classic slot at first, with its 3 reels and 1 line, but which you will discover that it is choke full of great features, including nudges, win spins, bonus games, multipliers and so on. Payouts go up to $5,000. The game is quite complex feature wise, including in the base game nudges of different kinds, skill stops and the option to hold a reel. The bonus game is the one that’s most attractive though, and it can award a lot of goodies, but more on that below. The formation of a new combination in this game is only the beginning, as you get a chance to repeat the win. Responsible for this part is a graphic placed on the screen’s left side, with a record that rotates and stops on one of the two possible positions, No or Yes. If it’s Yes, the win is repeated. 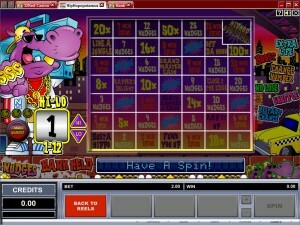 The bonus game is the slot’s biggest feature, which asks of you to collect trial counters as they appear. Once you have 8 of them collected, you get the bonus game started. You are taken to a board with 7 by 7 symbols, each one showing you a different prize. You have to navigate on it by trying to guess if the next number will be smaller or bigger than the current one that is showing. The numbers used are between 1 and 12. From these squares that are on the board, you can win bonus games, multipliers, nudges or win spins. Besides these prizes, other features that can be triggered as you play include boosts, a chance to restart the game, no lose, changing the number, extra lifes and shuffle wins. Among the names of the bonus features which can be started, you will find HipHopopotamus, Like a Jungle, Grand Master Cash, Rap It Up, Rappers Delight, Funk you up, or Bust a Hippo. 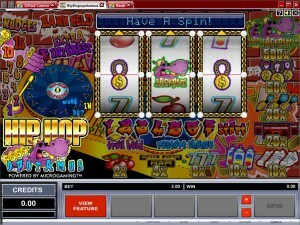 Like every other slot from Microgaming that has this many features, the bet only requires one coin to be used. However, its denomination goes from as little as $0.10, all the way up to $10, which is the maximum bet. The rewards mentioned by the game will put up to $5,000 in your pocket, the equivalent of 500x the bet. The theme and its hip hop inspiration sounds good, even with the hippo being the main character in it. However, the design looks very busy, with a lot of things going on at once on the screen. Besides the reels, you also have a lot of bonus features shown on the main screen, the paytable, and a background image that uses pretty much the same colors as the rest of the game, so things can get confusing. Symbols: Purple Hippo (500x), Dollar Gold Chain (50x), Microphone (30x), Boom Box (20x), Sneakers (16x), Spray Paint (10x), Diamond 7 (8x), One Bar (4x) and Cherry (2x). The game is special enough, and different enough from most 3 reel slots, to deserve at least a look from you. It has its own drawbacks, mostly connected with the very busy design, but overall it’s not a bad slot machine if you enjoy titles that are more complex. 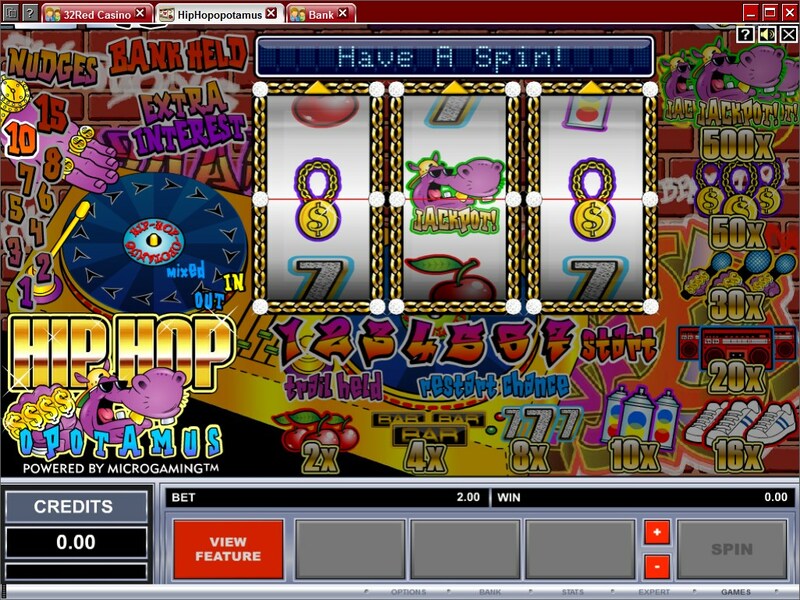 The HipHopopotamus slot machine is offered through the Microgaming platform, so if you want to play it for real or just to practice, look out for casinos that use it.